If you're planning to pop the question on Valentine's Day, you're not alone. February 14th is the most popular day for couples to get engaged in the US (source: Diamond Information Center). Depending on cut, carat, color and clarity, this particular Valentine surprise will probably be your most expensive. 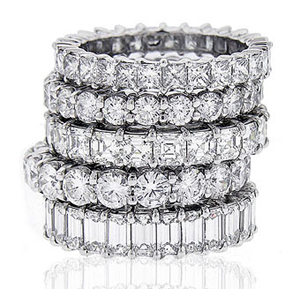 Here are a few basic diamond buying tips to help you get the best bling for your buck. Do your homework A purchase this big (and important!) shouldn't be rushed into. Learn about the four Cs: cut, carat, color and clarity. The fifth C? Cost. Read The Diamond Buying Guide for details and casually chat with your significant other about personal preferences to help guide your choice. Cash out Don't let a seller talk you into a more-expensive stone by quoting monthly payments. The interest rates will make the total payments go on forever. Wait until you have the cash. Work it Save even more when you buy store gift cards at up to 50% off the face value from sites that broker re-sold gift cards. Do not rely on photographs If you plan to buy a ring off a website, have a qualified jeweler examine the stone and setting before you hand over the cash. Size isn't everything The biggest determinant of diamond price and beauty is the cut, not carat weight or size. Examine stones with a variety of cut grades to understand what qualifies as a well-cut and affordable diamond. Get a report card Make sure your rock comes with a diamond-grading report provided by an independent professional lab that verifies its quality. DIY Consider purchasing a diamond wholesale, then allow your fiancée to select the desired setting. You save on the overall cost and avoid potential problems if your intended doesn't love the ring as much as you do!